Local officials would like to see more luxury boats and increased recreation on Monongahela River. Time and a federal grant may help them realize their dream. The cities of Morgantown and, Star City are also hoping a federal Boating Infrastructure Grant will do more than provide a convenient place for out-of-town boaters to dock. They're hoping the new boating attraction will lift existing time restrictions for passing through local locks and dams. Right now, the locks and dams at Morgantown, Opekiska and Hildebrand operate on limited hours due to budget cuts at the U.S. Army Corp of Engineers, which runs the facilities. This limits access for the area's pleasure boaters, especially those who would like to come down from Pittsburgh but won't for fear of being trapped, once the three area locks close for the day. The $100,000 BIG grant could be part of the solution. The grant would be used to build two docks in Morgantown, one at the bottom of Walnut Street, and the other near Hazel Ruby McQuain Park, said Tim Terman, chairman of Morgantown's Monongahela Recreation Committee. The Star City dock is scheduled to be expanded upon at the existing site, said Mayor Allen Sharp. Officials in Morgantown and Star City said the docks could lure more pleasure boaters, thereby justifying increased hours for the three locks. Patrick J. Donovan, riverfront development coordinator for the West Virginia Public Port Authority in Charleston, submitted the original application for the BIG grant in the spring. The U.S. Fish and Wildlife Services, the branch of government issuing the grant, then' sent it back with concerns, Donovan said. Donovan, resubmitted the application two weeks ago, and is hoping to get a reply within the next six weeks. The docks that would be built by the grant are intended only for pleasure boats, those which are non-trailerable and at least 26 feet in length. The BIG funding, said Terman, is provided on a matching basis. Whatever portion Morgantown and Star City spend of the BIG grant funding, each must match 25 percent of their own money. One big obstacle to realizing the dream: the Army Corps uses commercial river tonnage to determine the locks' operating hours. Pleasure boating is not included in these calculations. "Recreational boating can be developed, but not if the locks aren't open," said Don Strimbeck, secretary for the Upper Monongahela River Association - a citizens group. Richard Dowling, the Corps' Pittsburgh district spokesman,said the midnight shift in Morgantown was the first one targeted for cuts this summer because the public wasn't using that time slot. The three local locks and dams would need to pull in 1.5 million tons of commercial traffic to be open 24 hours, Darocha said. According to the Corps' Web site, only 830,000 tons passed through the Morgantown Lock and Dam for the 2001 year. No one could offer an answer to the problem of getting the Corps to change the way it measures tonnage. 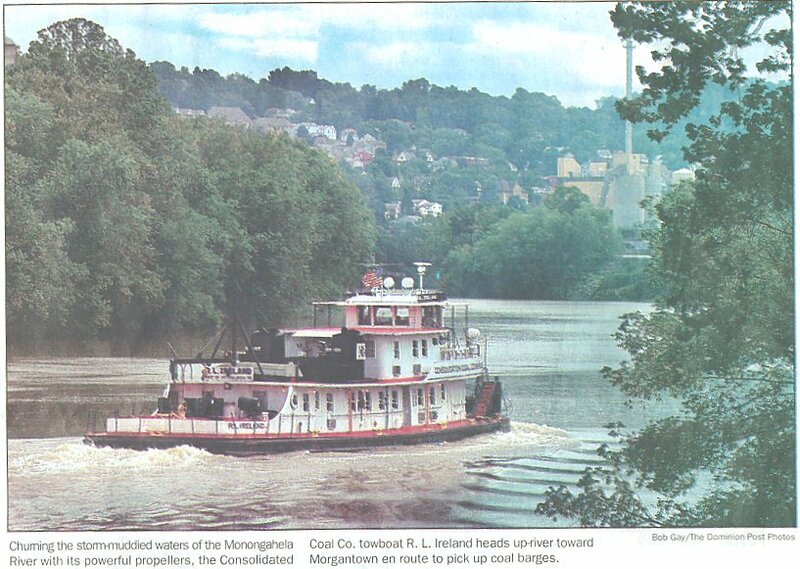 Strimbeck's group first presented the problem of the locks and dams shrinking hours to the Morgantown Area Chamber of Commerce in August 2002. Morgantown Lock and Dam is open the longest, from 7 a.m.-11 p.m.; Opekiska and Hildebrand are open from 8 a.m.-4 p.m.
On Oct. 1, all that may change again. "No firm decision has been made on that yet," said Liane Freedman, spokesperson for the Corps. "We know the budget's going to be tight and there's a lot of hard decisions to be made." Terman is confident the grant will come through, adding that it would be a first for the state. "West Virginia has never gotten one of these BIG grants - there's a lot of money out there," Terman said. Dowling would like to see the river used to its full potential. "The upper river (near Morgantown and Fairmont) is one of the least used waterways in the nation. Our view is it's one of the most beautiful and enjoyable."